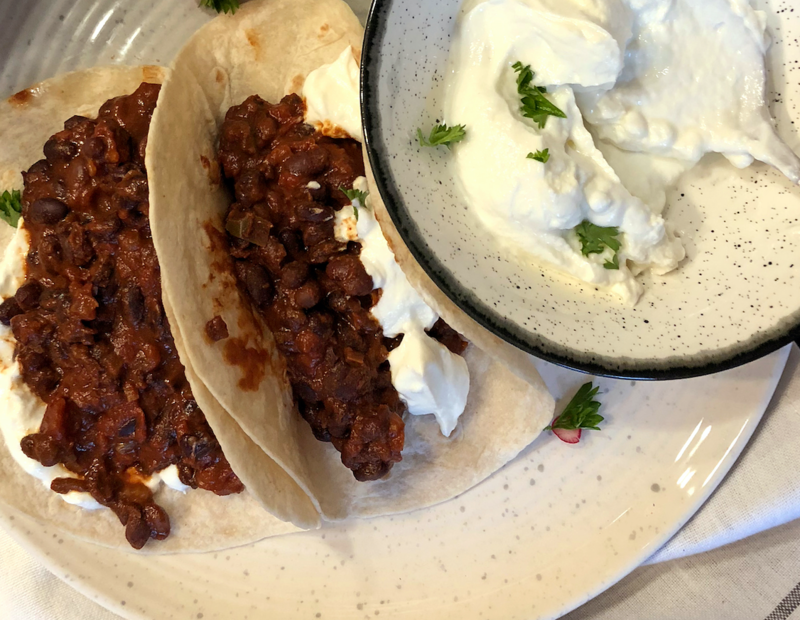 Nutritional value per serving Nutrient Per serving (one mini taco 146g) Energy 662kJ 158kcal Fat 4.7g of which saturates 2.1g Carbohydrate 10.2g of which sugars 4.3g Fibre 2.6g Protein 5.0g Salt 1.08g 5-A-DAY PORTIONS One mini taco counts as 1 of your 5-A-DAY target of fruit and vegetable portions. Soak the chipotle chilli in just enough boiling water to cover it, for 20 mins, then finely chop. While the chilli is soaking, finely chop the celery, garlic and jalapenos. Heat a non-stick casserole pan over a medium-high heat and add the oil, celery, garlic, chopped chillies, bay leaf and cinnamon stick. Fry for a few minutes, until the celery is softened. Add the tomato puree and spices and mix in well, then add the tinned tomatoes and veg stock pot or cube. Rinse the tomato tin around with a splash of boiled water and pour this in too. Mix well to break up and dissolve the stock pot. Add the drained black beans and dark chocolate, then give it a final mix and bring to the boil with the lid on, before turning it down low to simmer for an hour. After about half an hour, carefully take out the cinnamon stick, and keep the lid off for the remaining half hour. Check and stir occasionally to make sure it hasn’t dried up. Taste it, and season with salt and pepper, then serve with the mini tortilla wraps, yogurt, salad, cheese, avocado…whatever your heart desires!